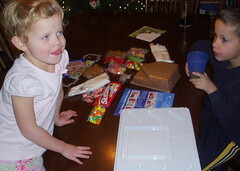 We bought this gingerbread house kit at the grocery story that seemed easy enough. 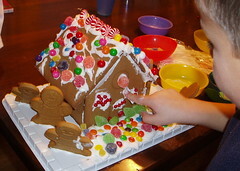 It came with ready-made icing and all the pieces. There was even instructions. How could we fail? It was easy enough to put together, but decorating it was a challenge. 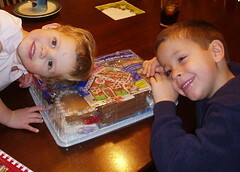 James wanted it to look like the picture on the box, and that wasn't going to happen. I've never been very good at arts and crafts. 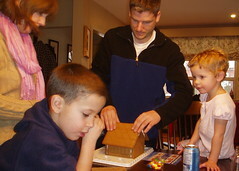 I documented the gingerbread house for dummies experience in this photoset. The end result isn't quite what we expected, but I'm pretty sure it's edible. I remember making those when I was a kid, too. They never do end up looking quite like they do on the box. But don't worry, it definitely is still tasty.